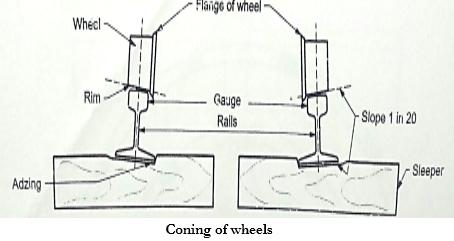 Explain with sketch coning of wheels and tilting of rails. 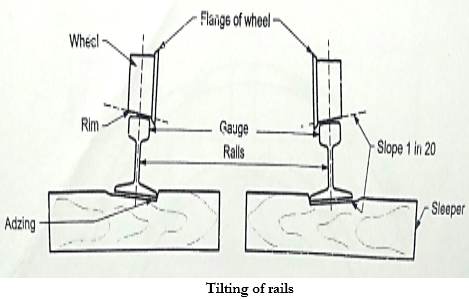 Question: Explain with sketch coning of wheels and tilting of rails. If the flanges of the wheel are flat then due to shocks there will be movement between wheel and the rails due to which vehicle will not be maintained in central portion due to which there will be unequal distribution of load. Therefore the flanges are made in the shape of cone with a sloe of 1 in 20. This is termed as coning of wheel. On curve outer wheel have to travel greater distances than inner wheels due to centrifugal force the axle moves towards outer rail and due to coning the diameter of wheels on outer rail increases and decreases on inner rails. This helps to cover greater distance than inner wheels without adverse effect. The rails are placed with an inward slope of 1 in 20 on the railway track. This art of placing of rails is called as tilting of rails. It the rails are placed exactly vertical, the top surfaces of rail will not come in contact with wheels fully and whole pressure is exerted on inner face due to which inner face is worn our quickly. So to avoid this and to make full contact of top surface of rail, these are placed at an inward slope of 1 in 20 which is known as tilting of rail.